A few years ago, Sergei Lysenko, a 40-year-old entrepreneur in Kazakhstan’s business capital, Almaty, returned to his parked SUV to find both sideview mirrors had been stolen. It took two hours before the police arrived. And even then, they did not seem interested in investigating further, Lysenko told Eurasianet. “They tried to persuade me that maybe I had lost them myself while driving, and that I hadn’t noticed. I understood that they had no intention of trying to catch anybody,” he said. As a tragic killing late last month has shown, however, Lysenko may have got off lightly. When celebrated Olympic ice skater Denis Ten confronted the men stripping parts off his car, he was stabbed. He died, aged 25, after suffering severe blood loss. The death sparked mass outrage and has kick-started a long-awaited effort to reform a police force that has struggled to curb soaring levels of petty crime. Police say around 90 percent of Kazakhstan’s sideview mirror thefts — like the one that led to Ten’s death — occur in Almaty. Investigations into Ten’s murder quickly turned up two suspects. But efforts to make over the police force are going further and aim at improving the public’s perception of law enforcement officers. The changes have been met with skepticism and incredulity. “[City police] will soon be client-focused, just like any retail bank,” political commentator Islam Kuraev wrote on Facebook with a hint of irony. Authorities have their work cut out for them. 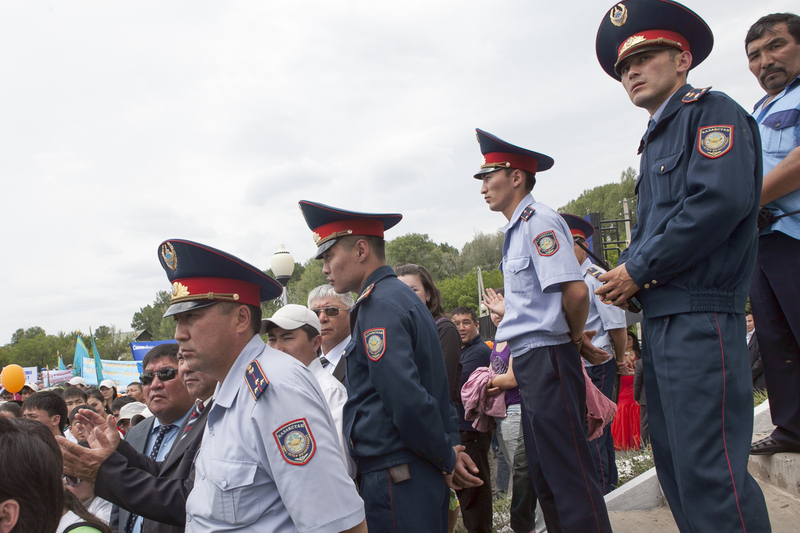 According to the General Prosecutor’s Office, crime in Almaty has risen fourfold in the past decade. "A whole heap of problems that should have been squelched before has piled up,” Andrey Grishin, a researcher at the Kazakhstan International Bureau for Human Rights and Rule of Law, told Eurasianet. A major issue, said Grishin, is that police are often not seen as people who actually help victims of crime. “People rarely turn to the police as experience shows that law enforcers are uninterested in catching criminals,” he said. Indeed, there is strong anecdotal evidence that police officers routinely seek to dissuade victims of crime from even filing reports. “The police try not to ruin their crime-solving statistics. The more complaints are recorded, the greater the percentage of unsolved crimes,” Grishin said. That kind of perception would explain a survey released by the General Prosecutor’s Office four years ago revealing that only 10 percent of the public trusts the police. Speaking to news website Informburo.kz, Askar Kaimakov, a lawyer and former investigator, explained that investigating every instance of petty crime can be an extremely time-consuming exercise for an under-resourced force. What is more, the best police officers often leave the force to seek work in the private sector, where the pay is far more lucrative, said Kaimakov. But there is a sense that part of the problem is that authorities are turning a blind eye to the scale of the problem. Almaty is host to a flourishing trade in stolen car parts – mirrors, headlights, wheels and so on. Pop-up markets and pawnshops trade freely in these components. Sure enough, in the wake of Ten’s death, local media reported on blitz raids on auto-parts bazaars and on the arrest of traders working there. As the police scramble to react, many seem to be turning to self-defense. Salespeople at the Hunter’s Dream hunting supplies store in Almaty, for example, told Eurasianet that demand for protective pepper spray has doubled since Ten’s murder. In the long term though, there are deeper societal trends that will have to be addressed to help contain crime rates. Erica Marat, an associate professor at the National Defense University, who has recently published a book on police reform in the former Soviet Union, said the aftermath of Ten’s death has exposed a lingering mutual suspicion between the well-off urban population and the growing number of people moving to cities from deprived rural areas. Different social classes are occupying the same space but holding prejudiced attitudes against one another, she said. While Kazakhstan has sought in places to emulate the “broken windows” approach adopted by New York City in the 1990s – wherein minor crimes are punished to deter more serious offenses – this has come at a cost. “These measures discriminate against fringe elements in society – internal migrants – and this is only increasing the class division in society,” Marat said. It may also be a problem that a lot of law enforcement reform, like much other policy in Kazakhstan, is being developed and implemented in a top-down manner, without involving public input. Marat said experts affiliated with the presidential administration are all too often overly concerned with the safety of prosperous middle classes and the political priorities of the government. What is needed, she said, is more public discussion about a police service that can be made to meet the needs of regular people, regardless of their status. “This will create conditions for real cooperation between the state and the population,” Marat said.